This has been a crazy week and only going to get busier. Between the Rain the past few days to getting ready for our annual Easter Drama trying to find time to fit everything into a day is sometimes real hard. I have completed 2 of the workouts and will work to get the rest in by Saturday morning. Been doing better on my treadmill times for cardio and actually starting to like using the inclines more. I keep reaching for goals and concentrating on doing the 5k in under 50 minutes. I am hoping that with the inclines and keeping a constant speed above 3.4 – 3.6 mph I can keep that pace on the course when we do it in a few weeks and depending on if it is more flat that hilly I really hope I can go faster that that. 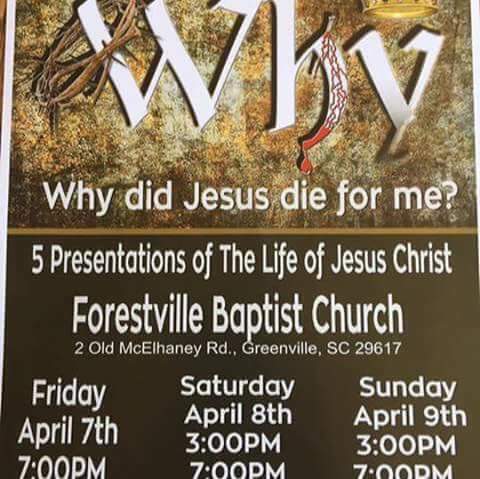 This week is our Churches annual Easter Drama……..
We have done this for many years and see a number of people come to Christ through each presentation. Although it is something that by the end of the weekend makes us all very tired if only 1 comes to the Saving Knowledge of Christ then it is all worth it. We ask for prayers for this weekend for everyone’s health and for all that are involved in the Drama. There are more people that I can remember involved in this from people acting to those that work behind the scenes. It never fails that at some point leading up to and during this presentation that Satan attacks those that are involved. We were supposed to have practice last night but due to the storms it was postponed till tonight so it is going to be a very long weekend so in addition to the prayers for the presentation I ask for them to be able to complete the Challenges we have to do for RBL2017 this week and still have the energy to do all that needs to be done. The “Why” play is awesome every year! The church and all that are in the production are in my prayers.